I always enjoy Dorothy’s blogs. This one is particularly close to home. This is one of the prime motives here at Over the Edge Farm, to find out how horses choose to interact with humans when they are “Free Agents”. One thing is for sure, the more I relinquish control, the more they choose to be with me. It is only our fear that inhibits the connection. Dorothy Heffernan always has something interesting to say. And I whole heartedly agree that isolation is punishment and detrimental to the well-being of any social animal. I am sitting here, ready to make the big announcement. But I hesitate. Procrastinate. Stare out of the window at the horses playing down by the lake. Tinker with the wording one more time. What’s going on here? This is the moment I have been heading towards for years. A lifetime. This is the place I envisioned. 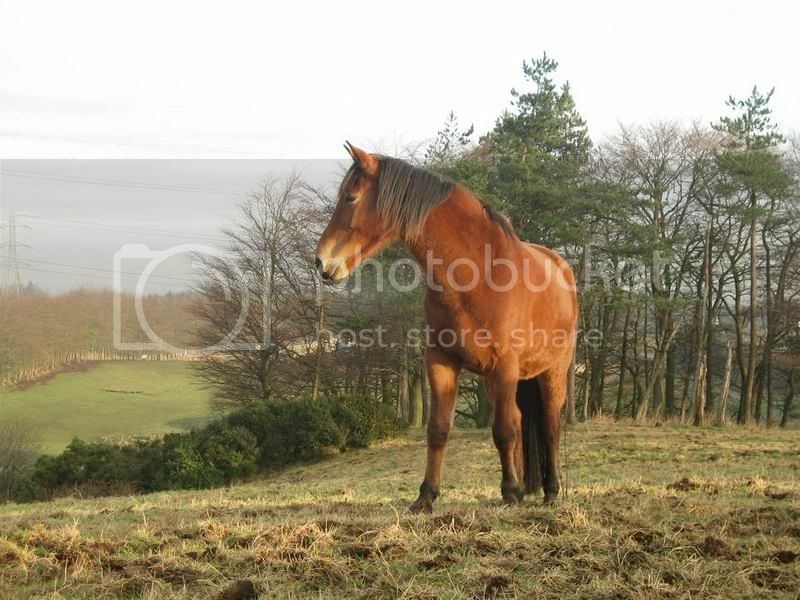 Where I could let my horses live as horses should, roaming the hills in a herd. Where I could live with my herd in harmony and freedom. Where I could watch them, learn what it is they really need to thrive in domesticity, and then provide it. The intention has always been to share this space with others who love horses, nature, peace, self-reflection. So they can come and learn from me, the horses and nature, in a relaxing environment that refreshes the soul. So they can return to their lives with fresh eyes and a smiling heart. It could have been Australia, New Mexico, India, Israel, Wales. But somehow we find ourselves in Portugal. And it’s perfect. The climate, the terrain, the people, the space, I love it all. The rocky hills and cork oak forests keep my horses fed, sheltered and fit. Our slopes are covered with lavender, cistus, helichrysum and other aromatics. What more could an animal loving aromatherapist want? Absolutely nothing. So here we are. Full of gratitude. Ready and waiting. All I have to do now is press the “Publish” button. Maybe a pause is natural, even a touch of nerves …..but then, if you are reading this I guess I took the jump. If you want to help me celebrate and spread the word, head over to our Facebook page and play “How many horses?”. You may even win yourself a free weekend with us. Healing the “Nature Plus” way. I can’t tell you how relieved I am to see Sufi 100% sound and tearing across the hills. Just 3 mornings ago I was faced with something I have been secretly dreading. A horse limping up the hill for breakfast! I could see Sufi’s head bobbing as she came through the tall shrubs. My stomach sank. But I’m an optimist: it was just a glimpse, maybe I was mistaken? As she cleared the cistus thicket there was no more doubt. The unstoppable Sufi was very lame. It didnt look sore enough to be a break, but could well be a tendon. I watched her hobble towards me, hoping it was only an abcess. I know how to deal with them. I met her half way up the hill. Her right front leg was definitely hot and puffy over the tendon area. My poor little Fire element princess. At just one year old, this is her first encounter with pain, and she is not taking it well. She is used to flying across the hills with total confidence in her body. She does not know what to make of this limitation and looks shocked, chastened, confused. So, here I stand face to face with the moment I’ve dreaded. Can I trust my gut and keep following nature’s route? Or is this the moment I will fold to the pressure and fear. The internal pressure of a mind conditioned to believe in western medical science, vets and doctors (we all are, even those of us who reject it). The fear of taking full responsibility for my actions, without some outside authority (an expert) to guide me. I sometimes wish I could play it safe and go the ‘conventional’ route. But no, this is another moment when I will have to step over the edge. Think it through step by step, never knowing if the decision is right or wrong until we see the result. OK, I can handle cold hose, and I have natural anti-inflammatories which can take the edge off the pain. I wouldn’t want to mask the pain completely, it reminds her to limit her movement to safe parameters. But box rest? Even if I had a box, I don’t think it’s the right solution. Horses need movement for proper function of circulation. Circulation is crucial for healing soft tissue. And the stress of confinement and separation would create a very unhealing environment. So box rest is out of the question. On the other hand, I am pretty sure tendons should not be overstrained when damaged. So I probably need to restrict movement. But in the wild they would have to move. Or would the herd slow down, self-limit, protect their youngster? Her mother Shanti is the lead mare, she can influence movement if she wants to, can’t she? So, should I just trust in nature, the herd? But the idea here at Over the Edge Farm is “Nature Plus”. The best of both worlds. I’m not going to let wolves eat her, or see her suffer unnecessarily. So, I have to find a way to I keep her and the rest of the herd happy and comfortable, and help Sufi heal. Luckily for me (Thank you universe! ), on closer inspection Sufi has an abrasion on the injured leg. About 10cm of hair is scraped off, but the skin is not broken This makes it probable that the injury is from impact; maybe she caught her leg in something. It’s less likely to be caused by a mis-step or other faulty locomotion. Therefore, I reason, it is bruised and swollen from the outside in. And while the tendon sheath feels ‘thick’ I don’t think anything is strained or sprained. This gives me more leeway in her care as I won’t have to restrict her movement so much. So, what am I thinking now? I need to restrict her movement to an area that is less challenging but still provides stimulation. I want all herd members to have access to each other to reduce stress for all. First of all, the easy bit. An area where I have a little bit of knowledge at least. I offer her essential oils and herbs to reduce the swelling and ease the pain. I then make a clay plaster, adding the essential oils she selects, and apply directly to the injured area. After this she lies down. 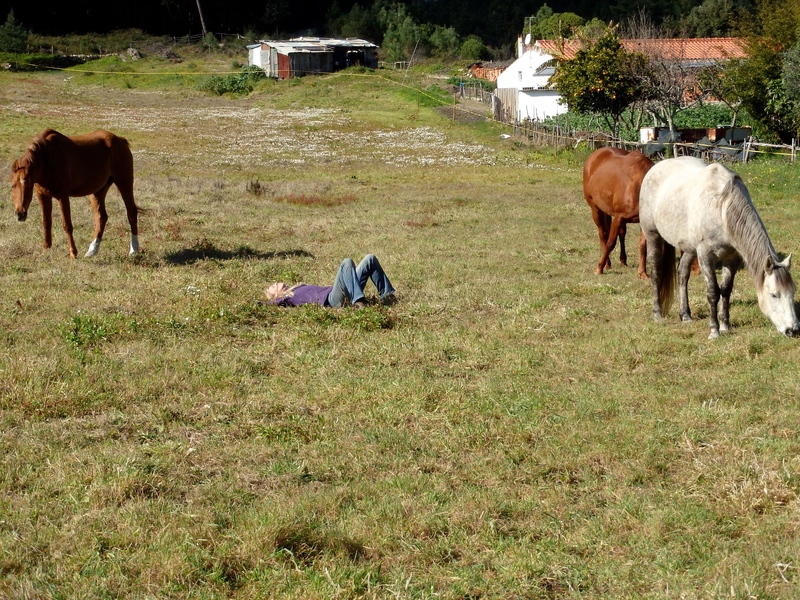 This turned into a lovely quiet healing circle as we were all drawn into the relaxation of two resting ponies. Our version of box rest! Sufi seemed brighter after this. So I bandaged her leg for extra support and released her and her mum to join the other horses, who had drifted off down the steep slope into the back valley. I am curious to see if Sufi will self-limit her movement. Shanti was ready to join the herd, calling and going down the hill. Sufi was reluctant to move too far or fast, limping pitifully. But it was obvious the imperative of the herd would force her to move if we didn’t intervene. So we decided to fence off the grassy slope close to camp. An area of about .5 hectare (approximately 1 acre). Meanwhile I put a halter on Shanti and take them both to eat grass in the ‘human corral’, where they don’t usually have access. Sufi forgot about her leg as she tucked into the green grass. Shanti was compeletely unconcerned about the other horses, until her stomach was full. Then she started calling. The others replied, but did not appear. So much for the herd sticking close to the lead mare. Once the fence was ready, I turned Shanti and Sufi out. Shanti motored off looking for a way to join the herd. Sufi hobbled behind her slowly. Shanti stands at the furthest corner of the paddock, calling out, definitely disturbed by her confinement. I settle her with some hay and Sufi soon lies down and sleeps again. Sometime later the rest of the herd came up to join them and they all have an afternoon snooze. Then it’s time to decide what to do for the night. Leave them all in the smaller enclosure? Leave a couple more horses with Shanti? If so which ones? Let Sufi out and trust in the self-limiting nature of her pain? As we stand and watch, the horses starting to move now, we wait for our next action to become clear. Because that’s what this process is. Once the goal has been clarified, it is not a movement of mental energies ‘thinking’, but a quiet receptivity. Watchfulness. It is watching the movement of energy, seeing the pattern unfold and going with it. Despite the fear, anxiety, “not knowing”. Arya stays close to Shanti as the others start to leave. She is Sufi’s big sister in every way that counts and so I leave her in with them. Hoping this will reduce Shanti’s stress. We put hay along the outside of the fence to encourage the rest of the herd to hang around too. They don’t. They drift off to eat grass, then around the corner to last night’s left over hay. The “Left behinds” are disturbed, slightly stressed. So am I. What if I’ve got it all wrong? The night is quiet. No whinnies of distress. Sufi rests a lot, sleeping peacefully on the soft, grassy bank. And in the morning? She’s barely limping! I can’t quite believe it, but the heat is gone. She takes only a small amount of meadowsweet, the pain relieving herb. So what do I do now? Keep on resting her as it’s working so well? Or let her out to roam the rough lands because today she’s probably up to it? We have the morning breakfast gathering and it becomes clear: Confinement is not an option. Shanti is adamant. All her body language and energetic intention pushes me to release her. And it would take a stronger woman than I to stand against such clarity. I take another deep breath and let go. And it is lovely to see that the herd’s movement does adjust to accomodate her. They are slower, they walk the flatter routes. There is always one mature mare at her side. Rohan is not allowed to play with her. At evening time I lead them slowly to homebase to ensure they don’t come haring down the slopes in their usual fashion. We are all mellow. Still, Sufi’s leg is slightly more puffy than in the morning, and she is obviously tired. I am hoping she hasn’t over done it. I give her another dose of homeopathic arnica, slather on the clay mixture, and go to bed wondering whether I shouldnt have closed her in overnight. Especially when heavy rain on the caravan roof wakes me in the darkest hours. In the morning the rain has stopped and the horses are not in sight. When they don’t appear for breakfast I go look for them, with slightly somber thoughts hovering next to my eternal question mark. I find them at the top of the property, grazing in the spring sunshine. Behind them, a long view over the hills to Spain. Sufi’s leg looks fabulous: slim, totally weight bearing. She is nonchalant. I watch her graze, moving along one slow step at a time, thinking what perfect exercise it is for a sore leg. Then she starts playing with Rohan, racing around and rearing up as foals do. I catch my breath, but she really is 100% sound. 3 days! That’s all it took. I reflect on what a perfect machine it is, this body, and how, in the right environment, it can heal itself so well. And I am grateful to have been one small part of this healing process, a humble servant of Horse. I bet you would like to know what ‘medicine’ we used? So here it is. Devil’s claw, analgesic 5 pieces of sliced root soaked in hot water for 15 minutes. She ate all the slices and drank some of the water. Milk thistle seed, to support Liver, which is necessary in any traumatic injury, especially if tendons are involved. Day 1 and 2 she took about 1/4 cup. Rosehips, for the vitamin c, immune support and anti-inflammatory support day one she took a couple of tablespoons. Day 2 she also took 2 tablespoons of echinacea root for immune support. Plai (zingiber cassumunar), also known as Thai ginger. This is a cooling anti-inflammatory, analgesic and one of my “go to” oils for any musculo-skeletal damage. She selected Plai and chamomile. Witch Hazel hydrosol (NO added alchocol) She wanted to drink it and I washed her leg with it to clean the wound, reduce inflammation and bruising. Witch hazel hydrosol, enough to make a mobile paste to spread on the leg with a spatula. She also ate a little of this blend. Once the ‘plaster’ absorbed/dried I bandaged the leg (don’t bandage on top of clay), applying Traumagon first. She also licked a little traumagon. In the evening of day 1, I removed the bandage and re-applied clay. Morning of day 2 she selected Traumagon over clay. Evening of day 2 she selected clay. Day 3 she didn’t want anything applied. Before we released her she also had a dose of homeopathic arnica twice on day 1 and in the evening of day 2.